A good power supply has always been a component that's recommended by ourselves and those who frequent our forums. Everyone has their personal favourites, and a brand name may arguably count for more here than on any other component. With the ever increasing need for power as technology development rampages onwards (especially if you're an avid overclocker or a gamer using SLI or CrossFire), then an efficient and solid power supply is an absolutely essential part to getting the most out of your system, without unnecessarily wasting money. The standard, if somewhat uneducated trick to determining if a power supply is worth having is by simply judging its weight; where the heavier the better, is the general consensus. However while that is true to a certain degree, other factors like adequate cooling without being too noisy, an efficient Power Factor Correction (PFC) and reliable power rails, are the fundamental differences between PSUs. The guys at CoolerGiant, a UK subsidiary of Enermax, allowed us to use their facilities in order to properly load test six different PSUs. While expensive, the testing equipment used standard off-the-shelf components that were unbiased in their readings. Like everyone, the CoolerGiant staff is full of PC enthusiasts who wanted to know and understand the best product on the market, so they were only too keen to help us. 700-850W is towards the upper end of the performance mainstream sector, where people need the power to run the latest dual core CPUs as well as a couple of hard drives and high end graphics cards, possibly in a multi-GPU arrangement. Each of the PSU's power rails was loaded at 50, 75 and 100 percent to test if it could sustain what it said it was capable of. While the PSUs were under load, temperatures were also taken to determine how well they were keeping cool as they reacted to the sustained load. Due to the limitation of the testing equipment, a maximum of four 12V rails could be tested at once. 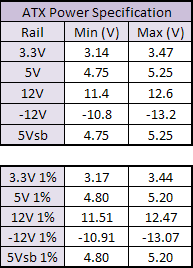 In every case other than that of the Cooler Master 850W PSU, we could test the PSU in one go, but because the Cooler Master has six rails we did two tests with a combination of 1, 2, 5 & 6 and 1, 2, 3, & 4. The official ATX specification is shown to the left, and if a PSU falls outside this range it fails no matter how quiet it sounds or what kind of special cable management it has. A poor power supply can affect total system stability and reliability, and that's not any savings at all. Enermax has launched a replacement for the ageing Liberty and Noisetaker II - say hello to the 82+ series. The non-modular Pro 82+ claims a consistent power efficiency of... wait for it... more than 82 percent. Let's find out how it gets on.